There have been many advances made with golf clubs over the last twenty years, which has brought in a whole new wave of innovation and comfort. Between having the choice of playing with hybrids, to utilizing a graphite shaft and the enlarged head with your drivers and irons, there are more choices available to you concerning your golf clubs than any time in the history of purchasing golf clubs. And while you might spend a lot of time researching the brand of clubs, or finding just the right clubs to fill your 14 club bag, there is one component which often gets looked over. Which, is weird, since it the only part of the club you actually touch while in your swing. This part of the club is the grip. Most golfers tend to go with the grip that either comes standard on the golf club or go with one that they think is best without actually trying various grips out. There is a very large assortment of grip options available to you, all of which have different capabilities and allow you to feel the golf club in a different way. Within this best golf club grips buying guide, we’ll review all the different types of grips available, and go into depth on what each grip can offer you. After that, we’ll give you a review of the top 10 grips in the marketplace. Then, we’ll help you narrow down your choices so you can find the best golf grip for you and your needs. When it comes to golf, there are different elements of golf that are detrimental to ensure an individual has the best experience possible and becomes a quality golfer. With that, one of the most important pieces of gear that are detrimental to the game of golf is a proper and well-built golf grip. Therefore, we are eager to bring you a quality golf grip that users will appreciate it. 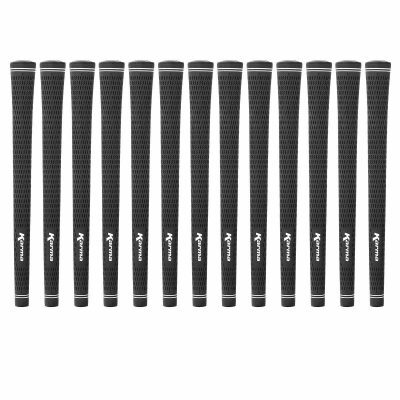 For our readers out there, that want a simple solution to the game of golf, here is the Karma Velvet Midsize 13 Piece Golf Grip Bundle. Let’s look at two important points of this golf grip. As we have said, the golf grip is crucial. The reason being is that an individual needs to be ensured that the grip will have the proper grip and style that they will need to succeed. With this, the first important point we want to make with this golf grip is the quality. The quality of the grip is the overall design and aesthetics. First, it includes an all-black color scheme that virtually matches with any golf club, making it extremely appealing. Not only that, but the best part of the grip, which is the grip itself is designed from a new and softer rubber material that ensures an individuals hand does not get tired. 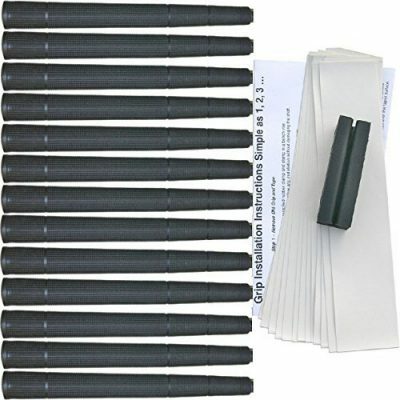 One of the best aspects of this quality golf grip is the fact that it is a bundle pack. As a bundle pack, an individual can always trade out their golf grip or include it in multiple club packs or putter packs. With that said, the bundle pack is really great for users that have different golf clubs or want to share with their golf buddies. Now, for the fact that it is a pack, it brings us to the next point. When it comes to cost and value, users tout the quality of these gold grips as one of the best in the industry today. The reason is not only the style, the aesthetics, the design, and the materials, it is the weight. As an enhancement to a golf club, the grip has to be lightweight and work in tangent with different styles of clubs so users can rotate. With that, the value is excellent and for the price, users may find it hard to find anything better. 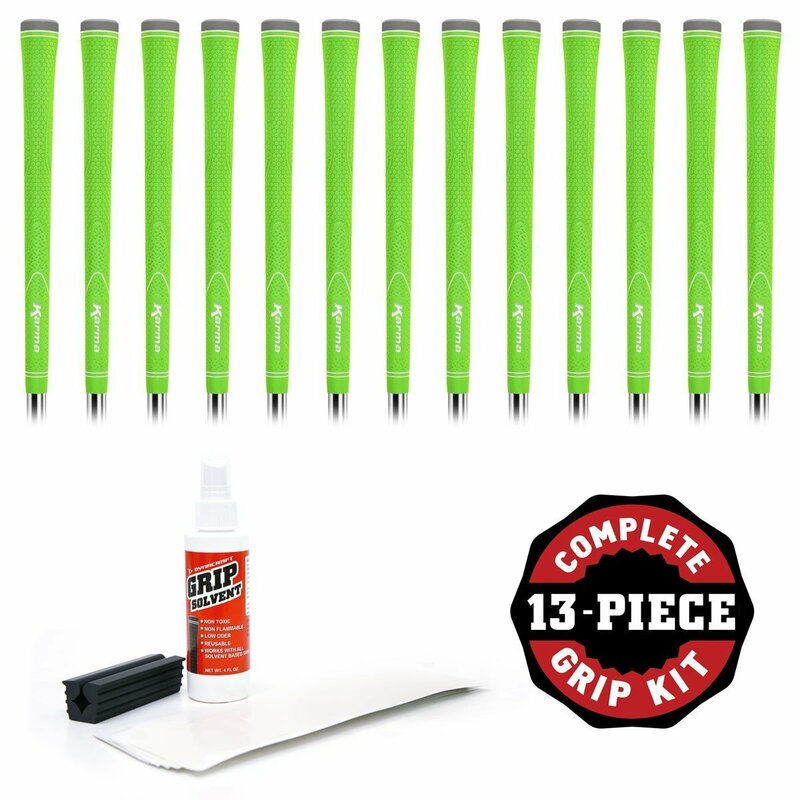 Considering the fact that a person is receiving a pack of 13, we can say it is one of the best grips out there. Very lightweight and easy to connect to your golf club. Pack of thirteen is a tremendous value. The grip size is a midsize grip style. Perfect for individuals that want to interlock their fingers. The grip shape is round and easy to use. The all-black color scheme is ideal. Users have mentioned that they’ve had to use an air compressor when installing these clubs. This next grip is a quality grip that is ideal for individuals wanting to enhance their game not only with a great feel and lightweight grip, but a bit of color. Let’s talk about the Karma Neion II Grip Kit, a grip kit with thirteen grips designed for effective use and great color fun. This is what users can expect from this quality grip set. Here are two important points to take into consideration. A quality grip has a pretty straightforward and simple design look. Even though different manufacturers and brand use different color choices. A great quality grip is designed with the texture of the surface in mind. With that said, this manufacturer has designed the grip with a multi-surface design that provides an ideal balance between good-feel and easy grip for users to use. In fact, the surface is also anti-slip so users can be assured that their next swing is the best swing. Finally, we bring a grip design tp individuals that want a little bit of fun in their golf game. 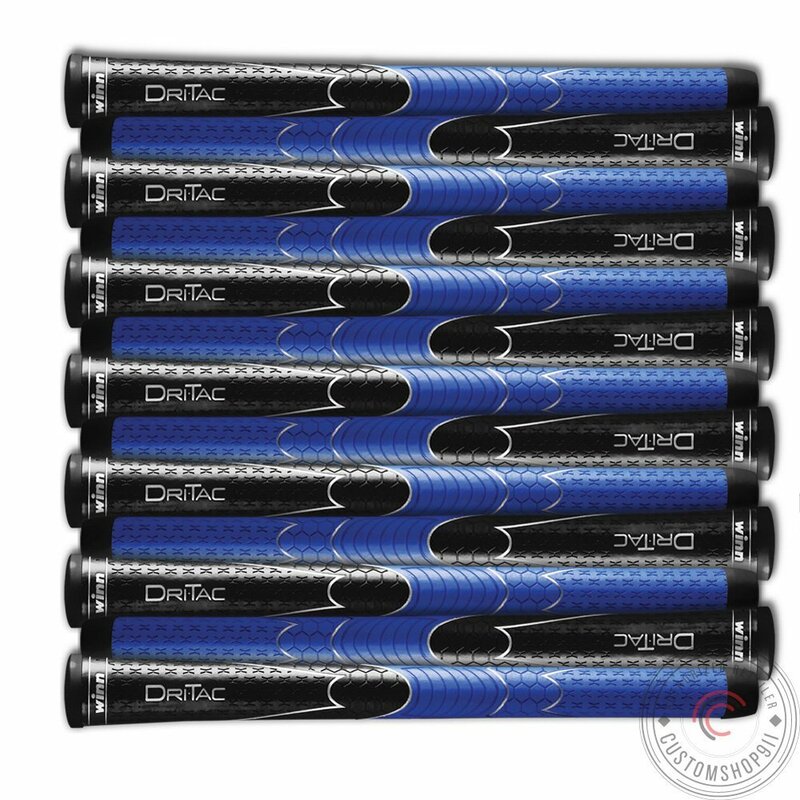 We can say one of the most touted aspects of these quality grips is the design and color choices. Users tout and appreciate the quality of the grip alongside the colors. The colors include lime green, neon yellow, fuschia, and even orange. How about blue? Well, they have it and they make every single club or putter look quite distinctive. As we take cost and value into consideration for this quality grip design, we can say that they are designed to withstand the test of time and they are really great for individuals wanting a quality grip that is also colorful. With that said, users will love the rubber textured surface feel on their hand and they will rest assured that they can get a better grip on their golf game. With that said, the value is excellent and for the price, although a bit pricier than most golf grips, it is priced as one of the best. There are many different colors for consumers to pick from. This is designed to offer golfers an excellent grip. Thanks to the anti-slip design, golfers will appreciate the added quality. The product feels soft to the touch. Users have mentioned that they grip does feel a bit light. As we come to another product on this list, we want to share with our viewers a quality product that users will appreciate for the design and quality. This next grip is specifically designed for putters and users will appreciate the quality design that makes them one of the best putter grips. This brand is well known, highly touted, and offers a quality design. Let’s talk about the SuperStroke Legacy 3.0 Putter Grip and what makes it one of the best ideal grips for users that love their putter. Here are two points to take into consideration. One of the most unique qualities of this putter grip is the parallel design of the grip that ensures maximum comfort in both hands. How does it do this, well the design on the inside is designed to distribute pressure to both hands so users can get an even grip. With that, it also minimizes hand pressure and possible tension in the arm and forearms. This helps individuals golf and putter much longer than they normally would be able to. One of the biggest and most touted qualities of this particular putter is that it is designed for professionals. With that, one of the professionals that uses it the most is tour pro Jason Dufner. The reason being is that this putter helps individuals perfect their pendulum swing and enhance their stroke. With that in mind, users can feel more like a professional when they use this putter. Considering it is one of the most popular putter grips and designed for professionals, we were shocked at the average price of this putter grip. Now, users should keep in mind that it is only designed for putters and they cannot use it anywhere else. Other than that, it is also priced at about half of the price of a thirteen pack. However, for the quality, users will be highly proud and happy to be able and use this putter grip. This is a high-quality grip that is designed for professionals. The product is USGA approved. Golfers will find assurance knowing that Jason Dufner has been known to use this putter grip. There are many different color options for consumers to pick from. Users have mentioned the 3.0 is too large, that the 2.0 is better. This is known as the most popular grip that an individual can get today from this brand. Durable and designed to withstand the test of time. We want to introduce a different kind of grip into the mix. Some individuals may have then ideal grip but they would want a grip enhancer to enhance the method and way they grip. Well, here comes one of the best inventions for starter golfers that want to learn how to grip a golf club properly. 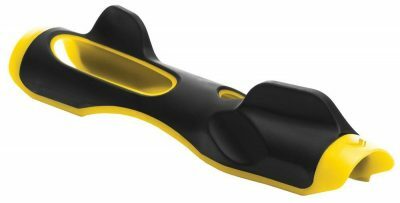 Let’s talk about the SKLZ Grip Trainer, the best training aid for golfers that are starting out. This is a grip that you attach to your current grip. Let’s look at two of the most important points users should take into consideration about this grip. Much like any sport, when an individual seeks in becoming a professional, muscle memory is a part of developing your skills to the fullest. With that, this training grip is great at helping individuals develop muscle memory when it comes to learning to hold the grip properly. Ideal for drivers, wedge, and every other golf club out there, simply just place on your current grip and becoming studying your hand position and body posture. With this, users can easily learn the game of golf. One of the best aspects of this grip is that it is small enough for an individual to be able to take it anywhere. With a quality grip trainer such as this, users have mentioned that they take this grip anywhere and everywhere. If you happen to be teaching your child or yourself to golf, simply place it in a backpack, purse, carry bag, and take it with you wherever you go. As we take cost and value into consideration for this particular grip, what we can say is that we cannot compare it to most grips because it acts more as an introductory grip design. With that, users will appreciate the quality of the group and tout their ability to easily install and use it. Now, for the price we consider the quality build very useful and valuable and users will appreciate it that it is designed for golfers that are just starting out. With that in mind, we highly recommend it. This product is great to help teach new golfers or those seeking to learn how to golf properly. This manufacturer can help create muscle memory for golfers. Great gift for all types of golfers. The materials used for the product was well-built and durable. This product is very easy to install and detach. Golfers can travel with this product with ease. This product was not designed for left-handed golfers. When it comes to sharing the best products with you guys, we always want to share the best of different products, so we can better help all individuals find the ideal products. With that, this next golf grip is perfect for individuals that suffer from a weak swing, weak hand strength, have arthritis, or want an easier grip when golfing. With that said, let’s talk about the Tacki-Mac Arthritic Serrated Golf Grip, one of the best grips for individuals wanting to enhance their swing or make it easier. This particular grip helps individuals that want a grip design is that is slightly bigger than other grips. The grip itself is a 3/32 oversized golf grip designed for individuals that have arthritics or have a weak hand strength. The design helps an individual hold onto the golf club better compared to having to close their hand more or tighten their fingers. With this design, a user can expect to easily be able to grip the golf club and swing. When it comes to a quality grip, one of the most important aspects of a grip is the materials. Reason being is that individuals need to be sure that what they are using will be durable and efficient. With that, grips are mostly designed from rubber or other lightweight materials, so they are durable enough for long-term use but also easy to use. With that said, some of the materials include a rubber vise clamp and the fact that the oversized grip is actually serrated. As we take cost and value into consideration for this particular golf grip, we can say that one of the most important aspects of the golf grip is the design of the grip alongside the build quality. With this in mind, users can expect that the grip is designed to be durable and give a lot of value to golfers that feel they cannot golf otherwise due to hand pain or arthritis pain. With that, this grip comes in a pack of thirteen, so users can place it on their wedge, clubs, and putters. For the price, we believe users will get a lot out of it and we highly recommend it. Great for golfers that are experiencing hand pain when golfing. This is great for golfers that are seeking and easy to use and install grip. The pack of 13 is the best deal for different golf clubs, wedges, and putters to ensure maximum coverage. Thanks to durable materials and properties, users have mentioned the item feels new even after months of use. Users have mentioned that they can be a bit slippery when wet. Let’s talk about one of the best bangs for your bucks for users that want a quality grip that they can easily install. This next pack is ideal for users that want a better grip for their putters, wedge, or different golf clubs. For young adults, or adults looking for a better grip to enhance their swing. Let’s talk about the Winn Drita AVS Mid-Size Grips, that come in different sets giving the consumer the power to use how many they desire. One of the best qualities of this particular manufacturer is that they gave the consumer back the power. They allow consumers to pick between a set of nine, which happens to be cheaper than a set of thirteen. With that, users that do not want a set of thirteen can buy from this manufacturer and rest assured that no grip will no unused. With that, users will also love the color scheme of the grips which makes it ideal for users to be able to tell which grip is theirs and another person’s. Now, what is the most important part of a grip? Well, the design, of course, an individual wants a grip that is designed with quality in mind and ensures a better grip. With this particular grip, users can rest assured that each swing will not be missed. The reason being is the rubber material that ensures a user can easily grab the grip and swing. With that said, the rubber material makes the grip anti-slip and water-resistant so users can swing even during rainy days. Never miss a day of golf even if a storm is coming! As we take cost and value into consideration for this grip, users will tout and appreciate the quality of the grip as well as the different quantity choices to choose from. With that said, this grip is perfect for individuals wanting quality and quantity. Perfect for amateurs and pro golfers, we believe the quantity matches the quality and the price is ideal for what users are getting. Available in different sets, thirteen or nine so individuals can ensure each club gets a grip. Rubber design is anti-slip and water-resistant. Comes in an oversized 1/8” which allows a better hand feel. Ideal for individuals want a quality grip. Color design is very masculine and looks good on virtually any grip. This product only comes in a mid-size. This is not sold individually. Let’s talk about one of the best thick putter grips that users can use today. This next putter grip is USGA approved, which only enhances the quality of the putter grip and it is ideal for users that want an even swing and grip. Designed for masters and amateurs in the field of golf, we are eager to talk about this next putter grip by an excellent brand. 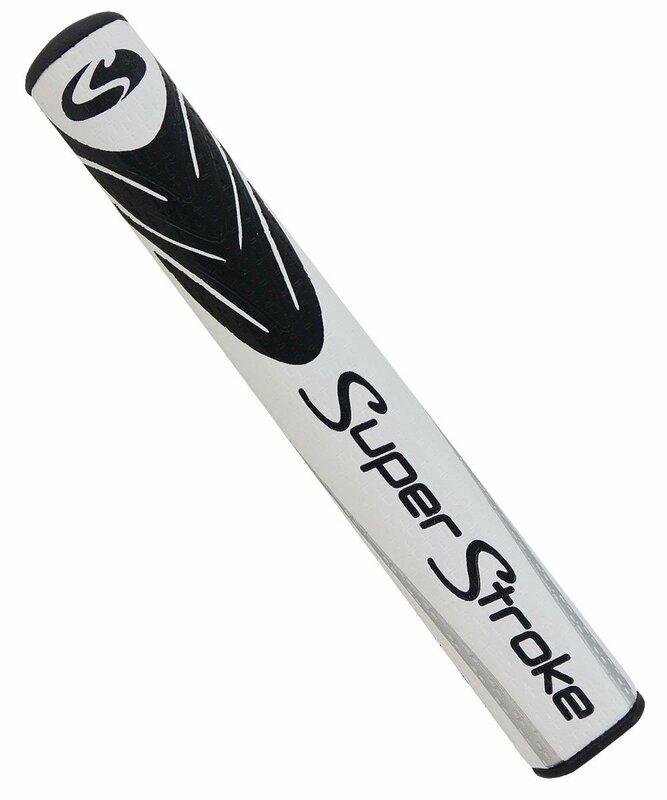 This is the Super Stroke Fatso 5.0 Putter Grip, a quality putter grip for different individuals. What makes this one of the best grips in the industry is the fact that it is designed for professionals. In fact, the grip is designed for pro golfers that understand the importance of a lightweight and easy to use design. With that said, this grip offers a light-weight foam under the listing for users that want quality and lightweight design. Alongside this, the design is meant to bring perfect balance and weight distribution to both hands when swinging so users never have to worry about their stance. Now, what is as equally important as design? The next feature! The material of the grip is what ensures an individual will easily be able to swing and hold onto the club or putter without slip. With that, this manufacturer has designed the grip from a well-built PU material that is both high tech and offers perfect traction. Online side this, the Cross Traction technology is improved for tackiness and fee, so users get a perfect swing every time with this golf club. As we take cost and value into consideration, we have to keep in mind that this is a singular golf grip, not a set. With that said, the value is easily-noticeable considering that many different pro golfers use this brand during tours and other tournaments. With that said, the price matches the value and although it is not overly priced, if some individual buys more than one, it can easily go up. However, we recommend it as one of the best grips for professional golfers. This is a high-quality golf grip designed for effective use and effortless golfing. This product is USGA approved, offering golfers the assurance needed to make the purchase. This is a fan favorite among professional golfers. This specific grip is available in a wide selection of golfers for golfers to pick from, including black, red, and even orange. There is an extra layer of tackiness in order to help golfers achieve the best possible swing and stroke. 5″ is considered ideal for almost any putter. Grip is only able to be installed ion putters. Only available in the standard size. This next standard golf grip is designed for individuals that want a quality golf grip and an aesthetic look at the same time. Now, this golf grip comes in different color options and it is designed for individuals that want a quality texture alongside style. With that said, let’s talk about the Golf Pride New Decade Standard Grip and what users can expect from this quality grip. One of the best elements of this particular golf grip is the quality design. The manufacturer has added a different texture style to both the upper and lower level of the grip so users can have a better grip experience. The lower part is different than the upper part, with the upper having an added texture design for better stability during an individual’s downswing. With that said, users can expect a powerful swing without worry about stability or grip. One of the toughest parts of a quality swing is that if the grip is not designed with traction in mind, then a user will have a bit of a sting in the hand. With that said, the grip allows for extra absorption thanks to the grip ridges and design. With this, users can expect a better experience when golfing that ensures their hand will not be in pain. One of the most important aspects of this particular grip is the design. With that, users can expect a valuable experience thanks to the soft rubber compound material. Another valuable aspect of this particular golf swing is the exclusive BCT Cord and the lightweight design. For the price, we were impressed that it was about half the price of other professional golf grips, which is great if users want to purchase the golf grip for different clubs, putters, and wedges. The materials of this golf grip are designed to withstand the test of time. This is a great golf grip for individuals that are looking for quality. This is designed with BCT cord on the upper hand with a comfortable soft rubber compound. This is incredibly lightweight and easy to use. Golfers will find it easy to install on any club. Consumers will have the option to purchase their grip in different colors. This product can help reduce tension and increase the power output. This grip is also shock absorbant. Only available in a standard size. The smaller opening is not ideal for every golf club. For users that want to be able to hit every shot with maximum performance and effortlessness, users can expect quality from this next golf grip. Available in many different color options and priced with quality in mind, users can expect a great grip that is durable and able to withstand the test of time. 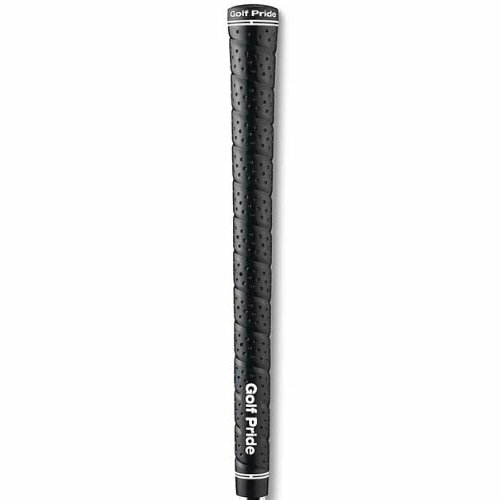 With that said, let’s talk about the Golf pride Tour Wrap 2G Grip and what users can expect from this quality golf grip. As we have said, one of the most important elements of a properly designed golf grip is the grip material. The right material is the bridge in which an individual ensures a perfect grip shot. With that said, users can expect that the rubber grip design of this grip is designed with maximum traction in mind and perfect for individuals that want shock absorption and high-tack rubber durability. Therefore, the one-piece simulated wrap grip is designed for individuals that want quality and comfort reassurance. One of the biggest design elements of this particular grip is the tackiness design. With enhanced tackiness, users can expect a better grip that ensures that no swing will be missed. Other than that, the grip offers an enhanced material feel that improves the performance of individuals thanks to the luxurious-leather like the wrap around the grip. With that said, the feeling of the grip resembles that of more popular but pricier golf grips available today. As we take cost and value into consideration for this golf grip, one of the best design elements of the grip is the spiral ridge design with leather-like materials. With that said, the value of the grip is superb and users can expect that it will accomplish what it is intended for. With that said, the grip is priced accordingly and users can expect quality. For the price, although you are only getting one, an individual is getting quality. This golf grip was created with quality in mind. This is a maximum traction design that most golfers will appreciate. This is great for any golfers seeking an enhanced grip. This is a one-piece wrap design that is effective, durable, and great for golfers seeking to improve their performance. The luxurious leather feeling resembles a higher-end grip. This can be used for different clubs, wedges, and putters. May twist off easily after years of use. Can become slippery if exposed to water. As the last product on the list, we want to share with our readers one of the best-designed grips available today. This grip offers one of the most durable materials that make it easy to use and great for all different types of putters, wedges, etc. With that said, let’s talk about the Winn Dritac Golf Grip and what users can expect from this quality golf grip today. Here are two points to take into consideration if a user is considering this golf grip. As one of the best quality grips available today, users can expect a great material content that makes this grip effortless to use. With that, users can use it for long periods at a time thanks to the design and materials. The material of this particular grip is also shock absorbent so users who suffer from hand pain or other hand ailments can easily and effortlessly use the grip. Other than that, the material is also very durable and easy to use. One of the best aspects of this particular golf grip that users can expect will be able to withstand the test of time is the material durability. Users want durability because it allows them to easily be able to use the golf club wherever they go or wherever they are. With that, this golf grip comes in many different color choices from blue, to black, and even pink. Users can surely be able to adapt this golf grip to any golf club they desire. As we take cost and value into consideration, one of the best aspects of this particular golf grip is the design and the feel of the grip. With that said, this golf grip is valuable and users will appreciate the quality design of the grip and how it feels in their hand. We can say that as far as value, users will be getting their money worth and for the low price, users can expect a lot of quality. With that said, it is only one grip, so it can get pricey to buy multiple grips for all of your golf clubs. This is a classic wrap style grip that makes it incredibly durable. Thanks to the multiple ridges, this product is designed with traction top of mind. This comes in wide variety of colors options and choices for consumers. This product can be used on any and all golf club styles. This is shock absorbent, which makes it easier for golfers to golf or putt without feeling pain. An individual can easily install this grip without hestitation. The re-gripping process can be hard. Will absorb moisture if exposed to water. When it comes to any sport, having the best quality gear is detrimental to the success of any individual. Whether you are an amateur or a professional, having the best golf gear is crucial to learn the sport properly and better your playing skills. Now, this is why we wanted to introduce one of the gear products of golf that at times may be overlooked by many amateurs, golf grips. When developing this list, we knew that we had to find the best and most quality golf grips for individuals. The real question was, how can we find the best golf grips? Well, this is when we began defining what would eventually be considered the criteria of this list. We knew that since many of our golfer friends rather spend the time on the course than learning about what are the best golf grips, we wanted to make life a bit simpler for our fellow golfers. With that said, we did the research for you! This is what we took into consideration when finding the best golf grips. The following is the full list of criteria that we took into consideration, what we considered “crucial” within finding the best golf grips. Let’s begin with the first criteria, the quality of the golf grip. Overall, to us, the quality of the golf grip is defined by the many other criteria that is below. However, quality is also defined by the overall composition of the golf grips and how the different aspects work together to ensure a high-quality item. Now, this is very important because no individual wants to spend hours researching, or their money to find that the quality of the grip is subpar. Quality, to us, is also defined by how long an individual can use the item or product for without it wearing and tearing, which we will get more into in the criteria portion of this list. With that said, we believe that all of the grips that we have included are primarily created with quality and durability in mind. So, what makes a quality grip? Well, the material! Let’s talk about the next criteria of a quality golf grip. This is a crucial aspect of many of our products because of course, users want materials that are of quality, not material that will wear and tear really easily. With that in mind, many of the golf grips that we have included are made with the best materials to handle different elements and wear and tear. As far as the materials go, a user will find within the price range that we have chosen, many golf grips made of PU leather-like material, ABS plastic, or rubber. With this material, a user can expect that the grip will not be too much but will be able to hold up its end. Now, why is the material important? Well, when talking about rubber, it is the primary chosen material for golf grips because it offers great traction. Traction is the crucial aspect of a quality grip to ensure that it will not slip the moment an individual swings the grip, which brings us to the next aspect, grip durability. Grip durability is one of the most important aspects that we had to take into serious consideration to ensure users were getting the best bang for their buck. The reason being is that a quality grip should be able to withstand the test of time. Therefore, as an individual will see from the list, we have included different grips that offer different grades of durability. Some grips are for starters, and you can tell by the price, while some grips are more for professionals. In fact, some of the grips will say that they were recommend or are the chosen grip by a professional golfer. Which leads us to another criteria we had to take into consideration, especially if a user wants to learn or become a professional golfer. When we developed the criteria to take into consideration for the best golf grips, we wanted to ensure that comfort was at the top of our mind. The reason being is that without comfort, an individual will not be able to properly grip and use the grip. Other than that, the grip has to be able to hold the club properly and be able to withstand the weight of the club, putter, or wedge. Therefore, comfort was of primary importance. Now, what defines grip comfort? Well, working in tangent with the material of the grip, grip comfort is primarily mastered by the style of the grip, the ridges, the traction, and the materials. The material needs to offer perfect traction, while the ridges allow for airflow to pass through the grip, and the possibly soak any moisture. Other than that, the grip size was another important aspect of comfort, one that we considered worth its own criteria. This was another element of comfort that was incredibly important for us to take into consideration. The reason being is that grip size is important to ensure that an individual can fit both of his or her hands comfortably. Now, as far as grip size most grips have about the same standard sizes, while some are designed for people with hand ailments or arthritis. For example, you will find grips on this list that are specially sized with a larger circumference for individuals that want a better and bigger grip and not have to tighten their hand so much while golfing. As far as other standard sizes, it all depends on the type and style of grip that an individual is seeking. For example, putter grips tend to be different than club grips and they will not be able to be tightened onto the same club. With that, many brands will offer different grip sizes and styles, which leads us to the next criteria. So this was also one of the most important aspects of a quality golf grip. When we started doing our research we found that there are many different grip options available. For example, a user can expect grips for all types of golf clubs such as wedges or putters. However, some grips are designed for putters only or clubs only, depending on the grip opening that you connect to the club. Now, we wanted to ensure that we included a wide variety of different grip materials, so users can rest assured that they were getting a wide variety. Maybe, with this, an individual may find a grip for putters that they would not have otherwise. Now, if you are considering a grip for your golf clubs, ensure that you know what you are getting, whether it is a package or single grip. As the next criteria on the list, we wanted to include a wide variety of available grip options for individuals. Since many of our readers range from amateurs to professionals, we wanted to include a wide variety of grips such as packages and singular items. Now, if you happen to be starting out and want to change up your game with a better grip but do not want to spend a lot. Then maybe buying a pack of thirteen or nine grips is the best option for you. With that said, a user can expect that a package of grips will only be medium quality. Still great, but not what the professionals use! Therefore, we wanted to add more to the mix by including some of the best brands that offer singular grips. What users will be able to notice is that singular grips are about or close to the same price of a thirteen or nine pack. However, that is because the quality, style, durability, and materials of the grip are enhanced for a better-quality golfing experience. Not everyone wants the same grip or for that matter, golf gear color. Therefore, one element and simple criteria we took into consideration was whether or not the brand offered different colored grips for individuals. What we did notice that many of the brands that offer package grips only had them in one color or two. For example, an individual can buy a thirteen pack of blue grips or a thirteen pack of black grips. Now, as far as grips that come in a single package, many of the brands we included offer some form of variety. Whether it was the neon colored grips, or the traditional white leather grips, individuals will find the ideal color for him or her on this list. Now, we are eager to talk about cost and value, one of the most important elements of all of the products that we take into consideration. As one of our criteria, we are always eager to share with our viewers are thoughts about the cost and value of many of the items. The reason being is that the cost has to of course, match or be less than the value. Our goal is to always find the best products for a great price. Now, with a specialty sport such as golf, users can expect that the gear they see will be a bit more costly than other sports and gear items. With that, many of the singular grips we have showcased on our list are priced according to the value of the grip, the name of the brand, or who is sponsoring the product, such as a professional golfer. This can, of course, bring up the cost. As far as packages, we wanted to share with our viewers the best packages that offer quality and quantity at a reasonable cost. As the last criteria on the list, brand history and reviews were very important to us. In the golfing industry, there are only a certain number of brands that run the show, and in turn, we wanted to include both notable brands and brands that users may, otherwise, not be aware of. With that said, many of the brands on the list have a phenomenal history of being some of the best and the reviews showcase that. Are the grip water resistant? This is one of the most asked questions when it comes to golf grips. Reason being is that individuals wanted to ensure that if they took the golf grip during moisture weather, that the grip would be able to hold its end. However, some grips are not moisture resistant and users should be weary about the grip quality to ensure that the grip is able to function properly. With that said, users should always read the description and label of the grip to make sure that the grip can be used during rainy weather. If not, it is best to leave the grip at home. Lastly, some grips will even mention the potentiality of wear and tare even with a bit of hand moisture because they may not be hand sweat resistant. Are the grips made from a durable material? This was one of the most asked questions because durability was of primary importance when it comes to purchasing a great grip. With that, the durability is really determined by the material composition of the grip and users should expect that some of the grips are designed for durability and functionality, while some are designed for amateur use. With that said, users should consider of the material is water-resistant or able to handle a lot of ware and tare. Can the grips work all on clubs or putters? This was one of the primary questions that users took into consideration and many individuals ask. The reason being is that there are universal style grips that work on all types of clubs, putters, and wedges. However, there are some grips that are designed only for putters or clubs, etc. Therefore, it is best for individuals to research and get to know the exact functionality of the grip and if it can be used on specific putters or specific clubs. Are the grips all the same color in a package? Can the grips be used without interlocking hands? This was a question that many users ask because this primarily focuses on the length of the grip. Some grips are shorter than others because they are designed for interlocking hands. However, some grips are primarily designed so individuals can place one hand above the other. With grips such as these, users can expect a quality grip that at times, also balances weight evenly depending on the design of the grip. What makes a great golf grip? When it comes to finding the best golf club grips, there are a few different components for you to know about so you can make the most educated decision. The most common materials when it comes to grip are thermoplastic and rubber. Each of these materials has their own advantage. A rubber grip provides a little bit of a harder grip, which tends to allow you to have a tighter grip on the golf club because there is not as much flexibility within the grip. Not only this, but it tends to be very durable, as it will hold up to the weather a lot better compared to other types of grips, especially when playing in more damp conditions. Most rubber grips have a non-slip tendency to them, so even if your hands tend to be sweaty, a rubber grip is a great choice. The thermoplastic or even a synthetic rubber material is a much softer material for you, which makes holding the golf club more comfortable. Not only this, but there is a greater sense of feeling with each stroke of the ball, while also providing less vibration, so your hands do not feel the sting of any poorly hit shot. In addition to this, this material offers up a tackier feel, so your hands will not slip while they are gripping the golf club, which is a solution to earlier models where golfers complained this material slipped within their backswing. When it comes to the size of the grip, there is a common theory out in the marketplace, which is normal sized hands just need the standard size of the grip. However, as more science has been introduced into the marketplace, there is a growing consensus that no matter the size of your hands, you should be tested to see what size of grip works best for you. Because the right side of the grip is actually determined by the type of swing you have, rather than by the size of your hands. There are five different sizes of grips available in the marketplace, including jumbo, mid-sized, large standard, standard and under-sized. You might think that your hands wouldn’t work with a Jumbo or an under-sized grip, but this might not be the case. Even if you are fitted for a grip, it is important that you swing a golf club using all five sizes of grips, but only after you figure out the type of material you want. Once you know the material, it is easier then to narrow down the choice of which grip size is best for you and your hands. It is very important to take this step, and here is why – studies have shown that having the wrong grip on your clubs could cost you up to five strokes every round. This is due to the comfortability of the grip, as well as the speed and velocity you can swing the club, and the accuracy of the club by not having it slip in your hands. There are not many things which are as inexpensive and easy to change out as the grips on your golf club which can deliver that kind of results on the golf course. How often should you replace your grip? Perhaps you have had the same set of golf clubs for five years, and haven’t changed out anything on the golf clubs. Which, there is no issue, but there is a standard which has been put into place for you to adhere to. Because of the all the elements you will deal with, whether it is the scorching sun or some heavy rain, and even some sweaty palms or even any rings you might have on your hand while playing golf, all of these elements affect the grip and will wear it down. Overall, grips should be replaced every 60 rounds, on average. The grips are thinner towards the head of the club, and this is where your thumb has the most effect on the grip. If your grip starts becoming loose or seems thinner than normal, then you will know it is time to start looking to replace the grip. If your thumb ever starts to slip on a swing, it will completely affect how the golf club will swing. This errant swing will have your golf ball flying in the wrong direction and will add more shots to your round. The one good thing about changing out a grip is that you do not have to do them all at once. There will be clubs you use more often compared to others, and those are the clubs you need to really focus on first when it comes time to change out the grips. Hopefully, thru this best golf club grips buying guide, you see the importance of grips to your golf swing. With numerous studies showing you could shave between four to six strokes off your score every round by having the proper grip, this is a very low-cost way of increasing your productivity while on the golf course. It does take a little bit of time, as you need to take around twenty-five swings testing out each grip five times; but, practicing for twenty-five swings to help save five shots over each round seems like a great trade-off. Once you have decided on your grip and size and design, we wish you nothing but luck and success on the golf course. Please write to us and let us know all about your new grip, and how it is helping you out on the golf course during each and every round! Golf: You’re Playing the Wrong Size Grips!